Many of my readers will know that Lucas used to take febrile convulsions, which I’ve blogged about here so I know how important a good thermometer is. He still takes fevers badly and his wee lips, hands and feet go blue. He is so poorly. It’s important to me to catch the fever before it gets too high and do something about it with medicine, reducing the temperature in the room and a tepid bath. When I was asked to try the Vicks behind the ear thermometer I was a bit sceptical as always used the in ear thermometer or the traditional ones, but thought I’d give it ago especially with a little baby on the way and let’s face it, it’s hard to get them to keep it in their ears for any length of time. 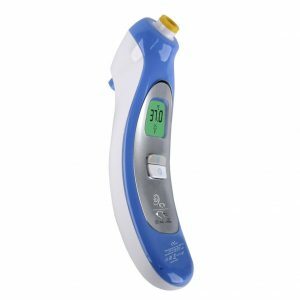 This thermometer works is that it measures the temperature of the blood carotid artery that runs behind the ear, thus providing you with an accurate core body temperature reading. Clever. It lights up on the screen which makes reading the temperature in the middle of the night easy, plus it’s colour coded too. Green for normal temperature, yellow for slight fever and a red for a fever which is 38 degrees or over. It took me a few practices to get the hang of where to place it even though there is a picture on the thermometer itself. It comes up with a failed message if you get it wrong. And you have to wait 10 seconds before trying again. That was the only downside but once I got it down it was fine. It was easy to use and it stores up to 8 readings which is useful. All in all I find this a good thermometer and you don’t have to buy and put on those wee ear cover things. Huge plus point. 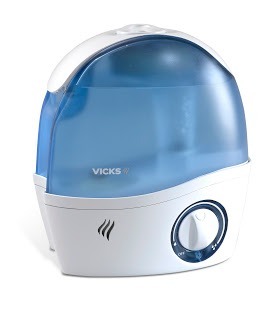 I have a Vicks Humidifier to giveaway which I reviewed here. I love this product and use it every night. It helps Lucas’ asthma no end and when they have a cold the menthol tablets make it so much easier for them to use. To enter all you have to do is follow the instructions in Rafflecopter below. It is open to UK residents only. Good luck. Disclaimer:- I was sent through the thermometer to review but I have not been reimbursed for hosting this competition.